An EXCEPTIONAL opportunity for a few EXCEPTIONAL people! What is the IPT Recruiting Partner Opportunity? IPT is looking for established Tension Management® Professionals with exceptional sales and marketing skills to become 50/50 “partners” with us in building our team of licensed ChangeWorks®, MasterStream® and Pride-Based Leadership® trainers. 1) By providing services to end-users. 2) By supplying those providers with the programs and services they need. As a supplier, IPT is dedicated to developing training programs and services in the field of Tension Management® and equipping independent and in-house trainers, coaches and consultants to offer those programs and services to their end-user clients. To that end, we’re expanding our Outreach team. Why is IPT doing this? I am about to turn 57 – so retirement is 5 to 15 years out – but I’m very thoughtful about what happens to my life’s work when I retire. Whatever else the transition involves, whoever will take over when the day comes needs to be highly capable of business development — so they can protect and grow our community. We are seeking a few Recruiters to partner with as a way for interested parties to make money in the short run AND prove their “worthiness” to take my life’s work to the next level in the long run. What is IPT trying to create? 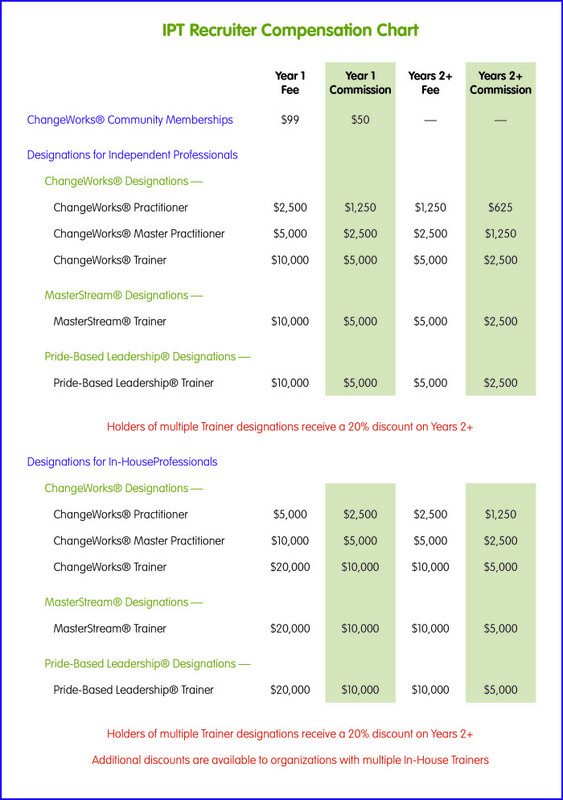 When our team is complete, there will be a total of 1,000 Licensed ChangeWorks Professionals, 100 of whom can be ChangeWorks Trainers, 100 MasterStream Trainers and 100 Pride-Based Leadership. In addition, we have room for an unlimited number of ChangeWorks® Community Members. That said, my capacity to certify people — in what has proven to be the most effective manner, which is one-on-one training augmented with annual/semi/quarterly physical retreats — is limited. So the number of people I can certify is limited to not more than 2 per week or 8 per month. At a certain point, we will need to certify one or more certifiers. They will be selected from the person/people who have proven themselves capable of business development and wish to become Successors. What is IPT’s long-term vision? Our vision is to identify a SUCCESSOR or GROUP of SUCCESSORS and then transition them into full control and ownership of the IP over the course of a structured buy-out. Who is eligible to be an IPT Recruiting Partner? You must hold and maintain your status as a Licensed Tension Management® Professional to qualify for this opportunity. What do IPT Recruiting Partners do? You market and sell licenses anywhere in the USA — and maintain sufficient contact with each licensee to ensure they are eager to renew each year. There are no quotas you are required to meet. Casual time … Part time … Full time … all levels of effort are acceptable as we seek out the Recruiters who will become our Successors. To be a 50% partner, you must take FULL responsibility for marketing and selling the licenses ALL BY YOURSELF. IPT must NOT be included in your strategy for closing a prospect. That said, being granted a trainer role is by invitation only, so a one-on-one interview with T is a fixed part of the process, immediately prior to the candidate’s decision. If you just want to give us a lead and let us take over from there, we pay a referral fee to Gold Team members of 10%. You could also give your lead to one of the Recruiters, but you’d have to discuss your compensation with them. What do IPT Recruiting Partners receive? (NOTE: The rates in the chart above reflect a discount for a lump sum payment. What do WE do for our 50%? IPT provides all billing services, delivers all training and support to licensees and maintains course training materials and the ChangeWorks® system software. We also provide a variety of training and support services for the Recruiters. What training do IPT Recruiting Partners receive? How will the FEW be chosen? How to source the best leads. How to advance a lead through the sales process. How to integrate the ChangeGrid®. How to sign someone up. How to sell organizational licenses. Feel free to give us a call with any questions you may have at 704-987-6500.